Second Baptist was not able to help Segunda financially, however did allow the use of a Sunday school room in their facility. Consequently, Pastor Rodriguez was a bi-vocational pastor working for Exxon Company USA, which relieved the church from having to pay a pastoral salary. With God's help and Segunda's faithfulness; within six months the church acquired a loan on January 27, 1983 from the Baptist General Convention of Texas for Fifty Five Thousand Dollars. This made it possible to purchase a church building at 1220 Mulcahy, Rosenberg, Texas at a grand total of Sixty Thousand Dollars. On January 22, 1984, the first ordination service was held in their new building, ordaining the first deacon of the church, Erasmo G. Gonzalez. As the churchgrew other deacons were ordained, today the church has five ordained deacons. Segunda Iglesia Bautista of Rosenberg, Texas was born on July 4, 1982. 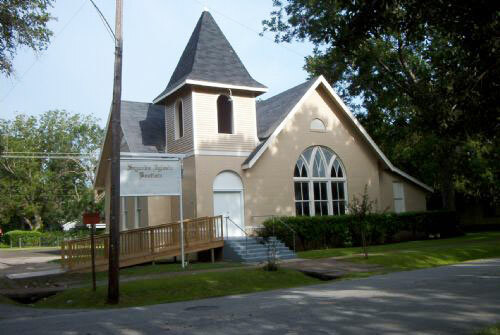 Initially, Segunda was a Mission of Second Baptist Church of Rosenberg, yet the vision was for Segunda to function autonomously and independently from a mother church. Thus, with that vision, Segunda was established by six people, Pastor Rogelio R. Rodriguez, his wife, two children and Mr. & Mrs. Erasmo G. Gonzalez. In January 1986 the church started expanding by adding a fellowship area and converted the old fellowship area into Sunday school classrooms. The men from the church did the work along with a carpenter that a friend of Pastor Rodriguez hired to help with the construction. This was another blessing, since it was at no cost to the church and he also paid for the slab for the foundation. The church also installed central air and heat to the fellowship and educational section of the building. Seeing the potential of growth in the community, Segunda started looking for some property to buy for future relocation. In January 1995 the church bought a 6.8-acre track of land on Mahlman Street in Rosenberg. The price of the land was Eighty Five Thousand, so another loan was acquired from the Baptist General Convention of Texas, this time for One Hundred and Three Thousand Dollars, which was the sum of the consolidation of both loans. The loan was a fifteen-year loan. Once again, the Lord blesses the church and it was able to pay off the loan on July 31, 1998, just three and half years from start date. On July 1985, Segunda Iglesia Bautista of Rosenberg constituted into a church and on March 7, 1994 Segunda Iglesia Bautista of Rosenberg was incorporated. In 1995 the worship attendance was close to hundred people and for the next ten years our attendance was averaging one-hundred to one-hundred-twenty per Sunday. Due to space constraints the church was not able to grow numerically, so Segunda focused on building a new church building on the plot of land it had purchased. So, Segunda hired Olympic Outreach, Church Facility Developer to help with the construction and finances. After several years of working on the design, drawing, and investing money on the project, Olympic Outreach folded and Segunda lost a substantial amount of money. Putting that bad experience behind them, Segunda continued to work on the vision God had given them. So, knowing that growth would not be possible in their current facility. In July 2004, First Baptist Church of Rosenberg opened its doors so Segunda could worship in their facility. This allowed them to put their church building up for sale, making it possible to use the money toward the finance of a new church building. Furthermore, moving into First Baptist facility made it possible to start four new Sunday school units. In addition, the Sunday school adult class was split into four classes with an enrollment of fifteen to twenty each. Also the preschool department was split into three. Plus, the attendance in worship increased; where there has been up to one-hundred-eighty-six in worship. Most importantly, these positive results have been possible even though the time of Sunday school and worship is from 1:00 PM through 4:00 PM. Segunda is a mission minded church. Currently, Segunda buys literature for two churches in Mexico. Getting ready to sponsor a new work in Durango Mexico. It also partners with a Hispanic Church in Rhode Island to pray for one another and help them with a small monthly offering. Also, there are two groups of people that go to Mexico to do Vacation Bible School during the summer months. Finally, in 2003 Segunda started a new ministry in Guy, Texas that is called Twin Lakes Ministry. A couple from the church that lives in the community, Henry and Mary Martinez, started a Bible Study for children on a weekly basis and is averaging an attendance of twenty-eight. This is a strategic ministry opportunity that aims to also reach the parents, of which some do attend. The aim is to establish a church in the near future as the Lord directs. Segunda Iglesia Bautista has been blessed with lots of talented individuals; there is a singing group and several people who sing solos. There are many musicians; and they are eager to minister with music. Consequently, the worship service begins with a “Rondalla”, a choir of ten guitars and a base. The worship services are traditional; hymns are sung that speak about the blood of Jesus, the cross, forgiveness of sin and heaven. Segunda saw the need to work with the youth of the church, so in September of 2003, hired, Julio Arriola, as a part time youth pastor and the youth group is growing. On Friday night at the Bible Club they have some 40 young people worshiping and studying the Bible. Julio felt God leading him into other areas in ministry. So, in August 2005 Segunda found itself once again without a Youth Pastor. However, God had been preparing someone to come and lead this young youth group. At the recomendation of one of its members the church invited Norberto Gómez to consider the position. After an initial meeting with Pastor Rodriguez, and the church deacons the church invited Norberto to a view of a call. The congregation voted and called him as the Youth Pastor. So, on September 2005 Norberto and his family joined Segunda. The Lord works miracles, it was God's timing, since Norberto and his wife had been praying for direction in their ministry. In less than one month God provided for Segunda once again to fill this need. The youth of the church have accepted Norberto and his family, and they have been working on various bible studies, youth activities, and continue to have good attendance at the I.C.E. Youth meetings every Friday night. "The youth of today is the Church", Norberto says and he already sees leaders in training. The Richmond and Rosenberg area, Fort Bend County, is one of the fastest growing areas in Texas. It is also the fastest growing Hispanic population. Hispanic is about 53% of the population in the area. Segunda is mainly a Hispanic congregation although Sunday school is taught in the English language. Pastor Rodriguez, and the faithful members of Segunda feel that Segunda can continue to grow in a larger building and lead more people into the kingdom of God. Segunda is blessed, it was able to sell their church building in March 2005 and is now working on new church plans and praying that the Lord allows the start of construction on the new building very soon. The building process began in January 2006 and was completed in the latter part of September 2006. The first service was held in October and on November 5th 2006, Segunda Iglesia Bautista had a very special service to dedicate their new building to the Lord. There were many people who contributed their time and effort to have the building built, but Segunda realizes that without the help of our Lord Jesus Christ, it would have been impossible.